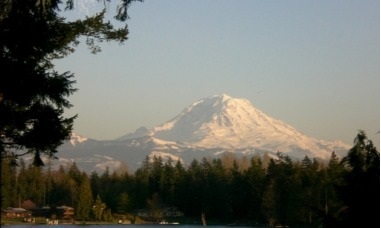 Is it a great time to SELL your waterfront property? Most would say no because of the coming winter months. But the facts are YES it is actually a great time. More people are purchasing waterfront properties this year over last year. Days on market are lower, and home are selling at a great value. 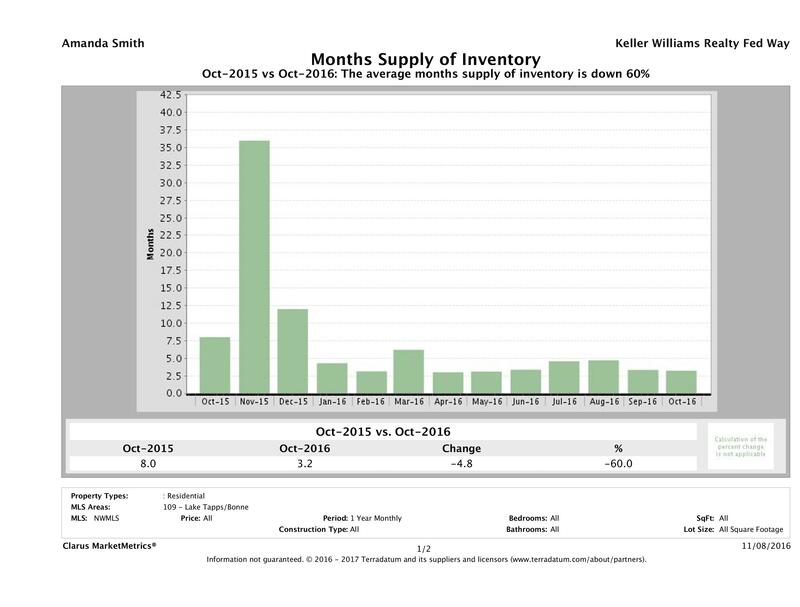 The chart below shows that Lake Tapps waterfront properties are low in supply, less than 2.5 months of supply to be exact. this is less than half from last year. So what that means is less competition for you when you are trying to sell. 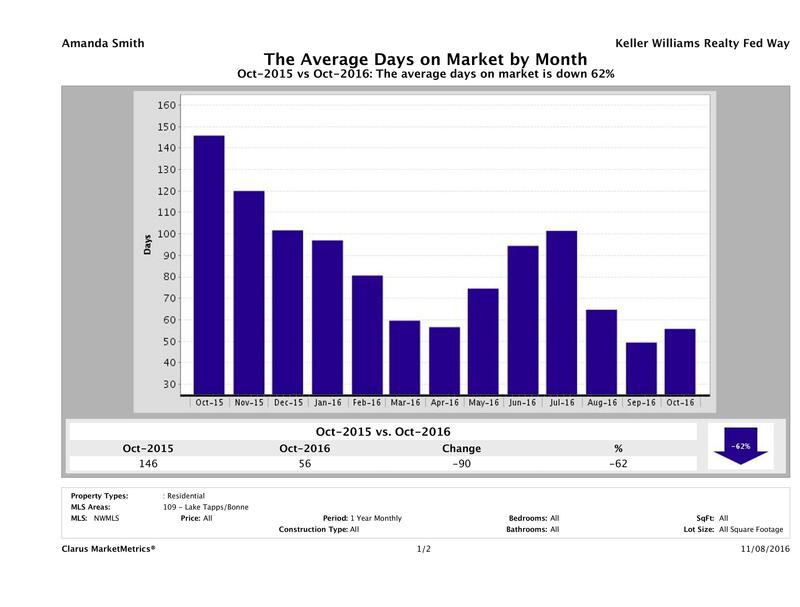 The next slide is showing us DOM (Days on Market) this means how many days it is on the market before it gets a deal and goes Pending or Pending Inspection. Sept was less than 50 days and Oct was less than 60 days on market. Compared to DOM last year in Oct, it is less than a third of the time. What does that say to me…The time is NOW!! You don’t want to miss this great opportunity to sell. The numbers of the market don’t lie. We are heading into a shift and these numbers may not look this good next year. The last thing we are going to talk about is sold properties by month. From the graph below you can see that is 2016 more homes were sold on the water than in the previous year. Sept and Oct are almost double the numbers they were last year. You can see that there was a spike in June as the number of people who are moving in General spikes that month. But looking at this chart realize these are closed homes, which mean to close in June that home was on the market at least 3-6 months. 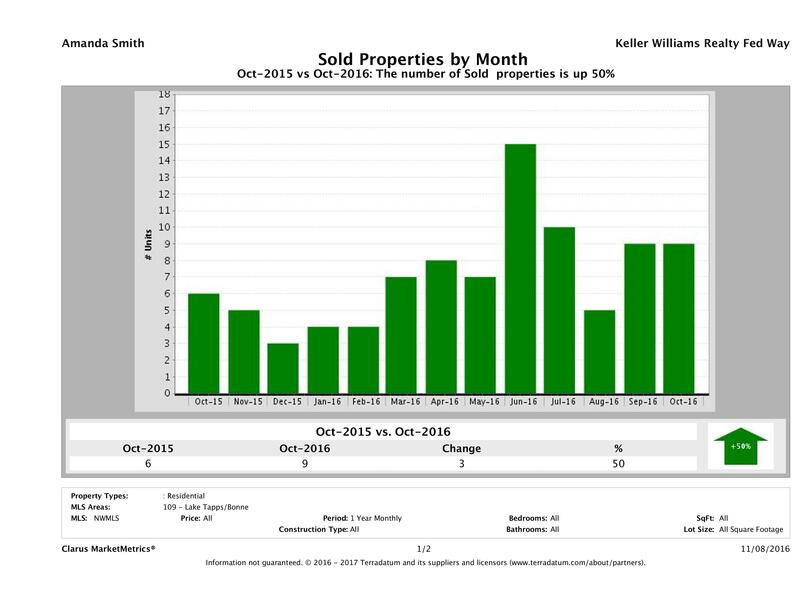 Looking back on the charts above, the homes that sold in Sept and Oct were on the market for less than 3 months on Average. So when thinking about selling your home please contact us, because we have access to ALL the facts on what is selling, when and how long it is taking. WE can get you the best price for the least days on market. FSBO always sounds like a great idea, and yes you can save thousands of dollars, but you can also loose thousands of dollars if you are not marketing to the world, and if you price yourself outside the market. So when you are ready to know more about your specific home contact us and we would love to stop by and tell you all about how we can sell your home.